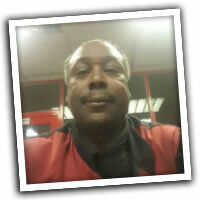 I have worked as Branch Manager for National Tyres since 2008. I believe the key to my success is good customer service. I enjoy interacting with my customers and if they leave with a smile on their face I know I have done something right. I have longstanding customers that keep coming back because I give them honest advice. I also really enjoy the challenge of hitting my targets and being at the top. Working at National Tyres I feel supported by my colleagues and enjoy good working relationships, we all help each other and there is a real 'family feeling'. There are opportunities to progress within the Company and we have training to help us.